In an ongoing attempt to reduce overheads and prevent us from getting our pants pulled down on cost, there may be temporary loss of service over the next week or so as we make the first of a range of changes to protect the forum for future use. Hopefully most of the changes will go unnoticed, that's the plan anyway - however if there are any significant developments we'll let you know as soon as we can. Is one of the changes that tweets are no longer embedded Matt? And just a link is posted? Thry do embed but they are oversized on my phone (iPhone). When embedding it breaks the width of the thread boundaries. CAn't get mine to do it at work or home PC at all. I 'm hoping that my Clyp.it goal commentary Clyps will be embedded as they are in twitter. 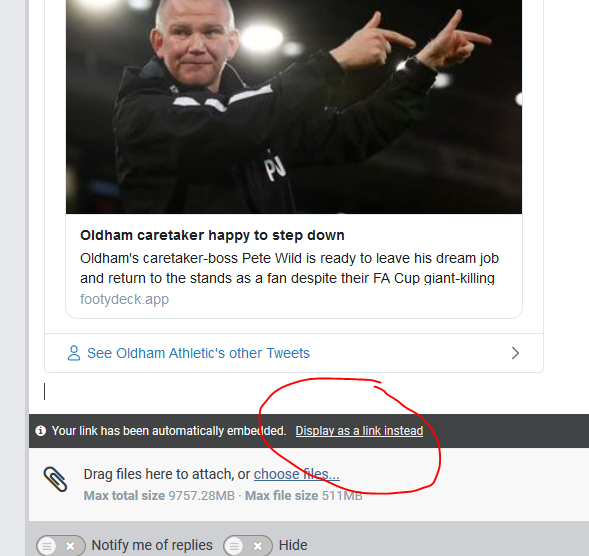 There is already an option available, note the below clip - there is an option (circled) that just pastes the link instead). Hi Matt, it's interrmitent. Not sure, why. Defintely appears blank at first with display as plain txt, I think I mighe have to ignore it. But counter intuitively, when I select paste as plain text it embeds it! It works anyway, that is the main thing. I guess it is settings my end. I'm afraid I can't replicate your issue, so I'm at a loss. Sorry. I'll see if I there are any options to make this easier. Cheers Matt. If it is a short time, then thanks. PLease dont spend any length of time on it! Much appreciated. Yes, signatures are gone, sorry. No probs Steveie, totally understand. That's very thoughtful, singe. Thanks for considering it. I've changed my location to link to your post, hopefully some see it. Just as a follow up Matt, I've been able to pinpoint this to a problem with Firefox. It works on my phone with Chrome, and at work (we are forced through a VPN) with IE, just not Firefox. Entirely possible it could be my settings, so might so some adjustments. No worries, let me know how that pans out because I'd like to know what is happening here - the website should work on all platforms equally. Can I suggest you disable all of your FF extensions and use the website - then add in extensions one at a time and reuse the website? It might pinpoint the issue as an extension (or a combination) rather than FF. I use FF and have no issue. OK, I disabled everything, then went into FF Safe mode. I can now see the tweets as tweets. I t still needed to be slected as Plain text rather than auto embed. I then added one of the addons I was expecting.One tab. Tried again, still Twweets dispalyed as plain text. Closed WOTB, repopened normally, but with no Add ons. Still plain text. I assume it could be other settings. So it only works in Safe Mode. EDIT Right. It's definitely the work WPN we have. just managedfine in the sectino outside the WPN login. Well it's a Remote Desktop Connection. Can someone here not just talk in English. I mean WTF. I have the website ‘bookmarked’ on my iPhone. The icon has always been blue. The icon since the changes is now red. Why is it red ? It’s driving me bonkers. It's not red exactly, it's the O in the logo at the top of the website - which is helvetica overlapped CMYK - which I suppose looks red in some instances. It's based on a Saville/Wakefield design; Wakefield said that "The 'O' was the sexiest letter" - so that's why it's the favicon and sharer icon. We'll change the banner from time to time, and we'll update the icons at that time too. It’s not the logo at the top of the webpage. It’s the bookmark logo on my phone. I’m not sure why that bookmark logo has changed ? As im typing this maybe thinking it changed as it thinks the website main banner is red now.